You are currently browsing the The Pet Product Guru blog archives for the day Friday, August 4th, 2017. It’s a common belief that all white cats are born deaf and that blue eyed white cats are prone to blindness and deafness. 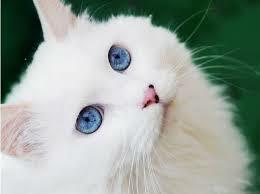 Blue eyed white cats are no more prone to blindness than any other cat. They are more likely to be deaf. White cats make up about five percent of all cats. Of these, fever than half have one or two blue eyes. Most white cats with orange or green eyes have normal hearing. Up to 80% of all white cats are born deaf in at least one ear. If your cat falls in this category, don’t worry. A deaf cat can be a perfectly sweet and attractive companion. If he is deaf, don’t ever let him outdoors. Keep him safe indoors with all of his cat toys and lots of love from you. The greatest oldies are in new place! The 50s 60s 70s 80s and standards! It’s Edgewater Gold Radio —turn on your oldies today! Listen on our website. The Edgewater Internet Radio Network! add comment Comments Off on Are White Cats Deaf?